Please excuse me while I have an ‘Emperor’s New Clothes’ moment. Complex, or ‘wicked problems’ cannot be solved by the simple process of picking up ‘best practice’ from one area and ‘ruthlessly’ enforcing it the next. Simple approaches to complex situations just don’t work (It’s worth a look at the definition of wicked problems for some context on this). Likewise, expecting to take a pilot and scaling it to ‘mainstream’ is just as challenging. There, I’ve said it…. 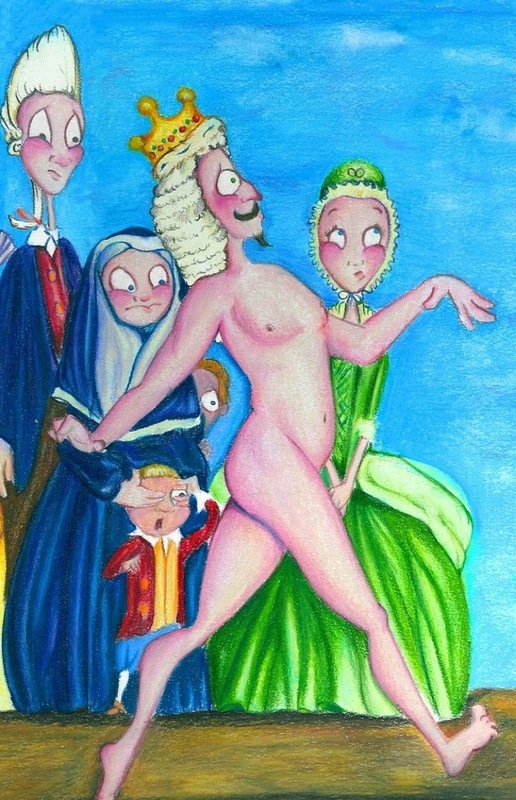 The Emperor of “Pilot Projects and Scale Up the Good Ones” ….. has no clothes on. Pilots are rarely run as experiments under controlled laboratory conditions. Just to explain some of my logic; achieving the same results in two different places is possible, if you are running an experiment under laboratory conditions. The sort of things you are looking for are: completely similar staring conditions, variables controlled or kept to a minimum during the experiment, high levels of predictability and changes that can be explained. Same starting conditions = Same outcomes (hopefully). Well, as far as I’m aware, most of the wicked problems in public services don’t have that sort of controlled ‘laboratory experiment’ feel to them. Things get more complicated when you throw in some ‘pesky people’, who don’t behave in a predictable ordered manner (and that’s just your staff). So what has this got to do with History* and Scaling up Pilots? As far as I can understand, the process of scaling up successful pilot projects (experiments) is just the same as applying ‘best practice’ as an improvement method. There are very many challenges and pitfalls, which aren’t ‘simple’ to deal with. There is a lot to learn from the experiences of trying to scale up pilots. Recently I followed a twitter stream (#intergrationpoineers) and slideshare presentation from Helen Bevan who was speaking at a gathering of NHS Integration Pioneers. The Pioneers were trying to build a learning community to tackle some of the complex challenges around the integration of Health and Social Care. 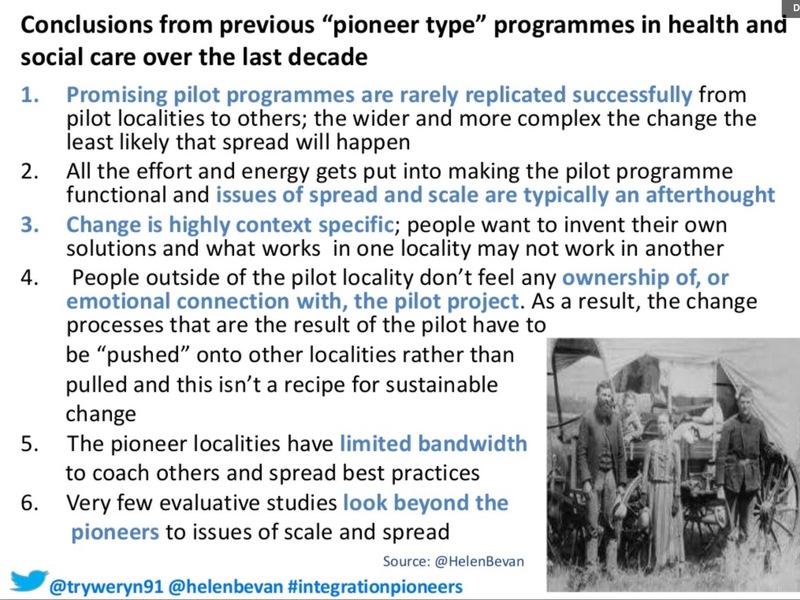 Helen’s slides very helpfully pointed out that there was a long history of pilots/pioneer activities that hadn’t quite managed to ‘scale up’ or go mainstream in the NHS and Social Care. I counted about 24 examples on slide 17. I think it is good to be reminded about what has happened in the past. We are all prone to a bit of ‘loosing the corporate memory’ of things that didn’t quite work. The whole area of learning from failure is something I have written about previously. The learning from Helen’s research into ten years of “pioneer programmes” is beautifully summarised in this slide (this is the *History bit I was referring to). Pioneers don’t tend to look beyond what they are doing in their own pilot. I will be following the progress of the Integration Pioneers with great interest over the next few months. Helen offered a series of approaches to help the Pioneers build a learning community in the rest of the presentation. These focussed upon a principles of ‘Open Innovation’ and Co-creation, link to the slides here. The principles of the approach feel right, and by coincidence came up in discussion at the Connected Care Camp (#psicare) organised by Shirley Ayres the following weekend. Involve diverse people, particularly those who are concerned with sharing knowledge. In a recent post Paul Taylor referred to them as ‘SuperConnectors’. Applying ‘best practice’ only works where situations are exactly the same (this doesn’t happen often in complex public services). There is a lot to be learnt from previous attempts to ‘scale up pilots to mainstream’. Recovering some of the ‘lost corporate memory’ would be helpful. Never underestimate the importance of emotional connections if you want people to accept a new idea. A very timely article as I stand at the front of a room full of NHS managers about to talk about innovation. Is part of the problem that what gets ported from a successful pilot is just the final operational model and not all the co-creation that led up to producing it? If you do that you can carry over some of the best practice and the big ideas but ensure that it is tailored to the local context. ← Open Data, Age UK Cheshire, Fire and Rescue Service, Dementia Advisor. Odd one out?